Building On Hope is on NH Magazine’s 2016 It List! Since channeling donations and volunteers to help rebuild and equip an Easter Seals NH home for boys in 2010, the can-do executive committee of Building on Hope has upped the ante every two years, selecting a worthy nonprofit group with a facility that was in need of extensive upgrade to benefit a core mission. Co-chairs Karen Van Der Beken and Jonathan Halle (center and right in the photo at right) worried they may have reached too far when they selected the Michael Briggs Center of the Manchester Police Athletic League for 2016. It was apparent that restoring the decrepit former St. Cecelia Hall on Beech Street would cost more than a million dollars, but it was also exactly what they were looking for: an organization doing important work for thousands of at-risk kids in NH’s biggest city and bringing young people and cops together to forge bonds of friendship and respect. 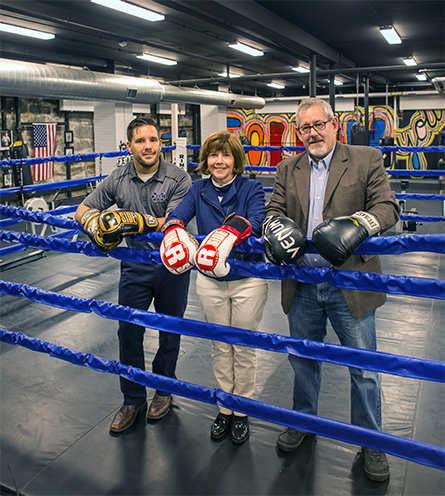 No one knew the need, and the benefits, better than Officer John Levasseur, the MPAL coordinator and head boxing coach. “It really is a miracle,” says Levasseur (left), after touring the center, revamped with a fully functioning HVAC system, institutional-scale kitchen, game room and homework center. He notes that since the building was completed, his work could really begin, fighting the good fight for kids in the neighborhood.